To Become a “Miracle Worker” Too | Hey, Mrs. Winkler! 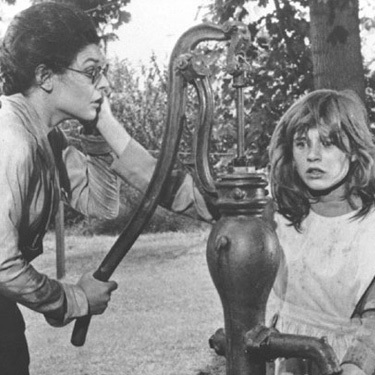 Anne Bancroft and Patty Duke in 1962’s “The Miracle Worker” by William Gibson When I was a young girl in the 60’s, I loved to watch old movies on Saturday afternoon. Some of these movies made a deep impact on me for one reason or another. I remember watching one of my first Shakespeare plays on Saturday morning–the 1935 version of Midsummer Night’s Dream starring Olivia de Havilland as Hermia, Andy Rooney as Puck and James Cagney, yes, James Cagney, as Bottom. I didn’t know any of those actors then, but I was fascinated by their actions. I barely understood a word of what was said but I was mesmerized by the words. So many movies during those halcyon days, when my viewing choices may have been fewer but have rarely been better, helped form my love not only of film but also of story telling and the theater, psychology and human development, justice and mercy–movies like Citizen Kane and Rebecca, Stage Door and All about Eve, To Kill a Mockingbird and 12 Angry Men. However, there is one movie that told a story which stands out above the rest in my mind, a story that helped solidify a desire that was already growing in me before I was a decade old–the desire to teach. That story is told in the 1962 film The Miracle Worker, the story of Helen Keller and her teacher Annie Sullivan. I can’t remember a time I didn’t want to be a teacher, but watching Annie struggle to teach Helen, to give some meaning to the child’s dark and silent life by giving her the gift of language and in return seeing her own life change from dark to light, caused the stirrings of desire to leap into a consuming passion. I was reminded yesterday of this great story and its impact on my career choice when I went to see our local community theater’s production of William Gibson’s play. I’ve seen it several times over the years and the movie many times, but something about the intimacy of the small theater and the fine acting by my friend who was playing Annie and another friend’s young daughter who played Helen, brought back the force the story and its impact on my life in a way I hadn’t felt in many years. This time, however, I have been a teacher for thirty years, a bit jaded about my profession, especially these days, especially in North Carolina, but watching Helen’s face at the water pump as the water flows over her hands and she finally understands what words are, seeing Annie’s face when Helen comes to her with her new found knowledge and signs that special word “teacher” renewed my love of teaching. I wanted to teach you—oh, everything the earth is full of, Helen, everything on it that’s ours for a wink and it’s gone, and what we are on it, the—light we bring to it and leave behind in—words, why, you can see five thousand years back in a light of words, everything we feel, think, know—and share, in words, so not a soul is in darkness, or done with, even in the grave. And I know, I know, one word and I can—put the world in your hand—and whatever it is to me, I won’t take less! I learned a great many new words that day. I do not remember what they all were; but I do know that mother, father, sister, teacher were among them–words that were to make the world blossom for me, “like Aaron’s rod, with flowers.” It would have been difficult to find a happier child than I was as I lay in my crib at the close of that eventful day and lived over the joys it had brought me, and for the first time longed for a new day to come. Mother of the woman, too.